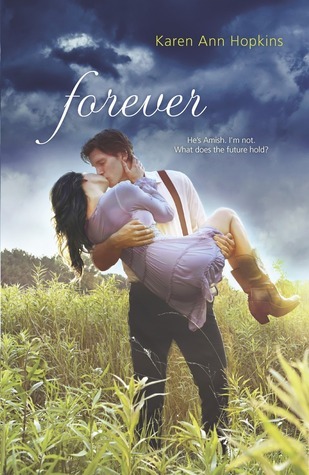 Forever is the third book in the Temptation series. I'm going to have my review of the second book, Belonging, up tomorrow. I can hardly wait to read the third one! ASDFJASFJASF. I can't wait for this. I literally can't. Even though there are so many things that I don't like in this series, it is so addicting. GREAT, GREAT PICK! A nice pick Alison! I have only read the first book in this series. Nice! Actually saw this one a few blogs back! Hope you enjoy it too! Cute cover! Been wanting to start this series! I find the Amish really interesting and I can imagine having to change your life to fit in with your significant other would be difficult. I do love a good happily-ever-after. Especially after you've been waiting on it for a while! I've not checked out the series, but it sounds really good :) I've heard about it. Great choice! I really need to start this series. I haven't read this series yet, but I do love this cover! It's all dramatic and romantic and I love the colors:) Looking forward to your review tomorrow of book 2! I started the first book but hated all the agnist build up. I'm thinking I should give this a try again. Great choice! I have been looking forward to this for so long! Anyways besides your good taste in Wow books aha, I’ve been reading for posts and I seriously put 3 books in my TBR shelve so thank you for that! Wow-pregnancy? Don't see that much in YA books but it does seem like a thread that would bind them together in Amish culture. Guess replica watches expenditure is very on virtual stores and then the procedure equally conserves great deal of time. Guess, essentially the most preferred brand names, furthermore has produce an exclusive bunch of designer label and also quality built watch, within marking Fossil watch. Your precious time Thus giving strategy to group managing web sites to assist you to together with the operate may be the greatest strategy Group managing web sites generally benefit the e standing or e buy instagram followers managing which not merely implies cleaning the negativity through your brand online and also endorsing a similar to improve levelsTwitters marketed tweets are contrary to their Yahoo and google and even Fb equivalentsThis is due.